I’ve had an opportunity to visit quite a few amazing restaurants since moving here – though I have neglected writing about them…until now! A huge part of the excellence of the city is the culinary scene. Boston has incredible restaurant options, some renowned worldwide, while others are just locally raved. Of course, when you ask Bostonians for things to do, you typically receive a large amount of food recommendations. I’m just starting to work through them all! One of the places that I visited recently was Church in the Fenway area. The restaurant is highly rated on sites like Yelp, so I figured I was in for something pretty good. And frankly, it did not disappoint. A friend and I stopped by for brunch on a Saturday, before hitting up the Isabella Stewart Gardner museum (which I’ll record in a future entry). The atmosphere is very warm and open – as there were couches and booths along the wall, while tables and a decent bar area filled the rest of the space. The menu and drinks are themed with religious history, which was honestly very well done and incredibly creative. My breakfast, the Eggs Benedictine, was incredibly delicious. 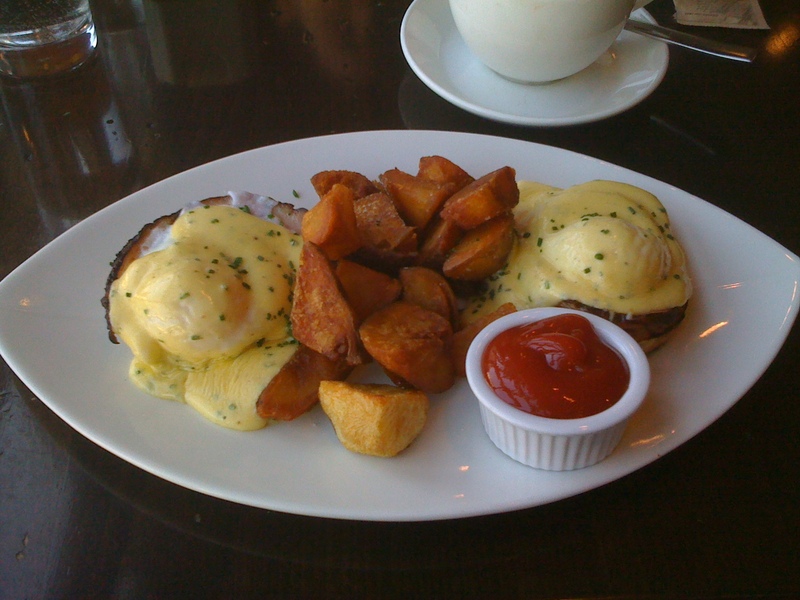 I’m not a huge eggs benedict fan but I would definitely order this again. My friend ordered the Toad in a Hole, which consisted of two slices of french toast with poached eggs and crisp bacon on top. I was able to sneak a bite of this dish, and though I don’t like mixing sweet and salty, I couldn’t help putting this on my favorites list. The service was great and the price of two dishes with coffee was only 20 bucks. Really a steal for a fancy restaurant in the Fenway area! Church also boasts an interesting music scene, as there is a concert venue attached to the back of the restaurant. I would definitely recommend hitting up Church, if you are looking for some tasty food. If I don’t go back for brunch soon, I would love to try this spot for dinner and drinks. This entry was posted on Monday, January 31st, 2011 at 12:56 am	and tagged with Boston, Church, Fenway, restaurants and posted in Uncategorized. You can follow any responses to this entry through the RSS 2.0 feed. « Winter Wonderland or Frigid Wasteland?